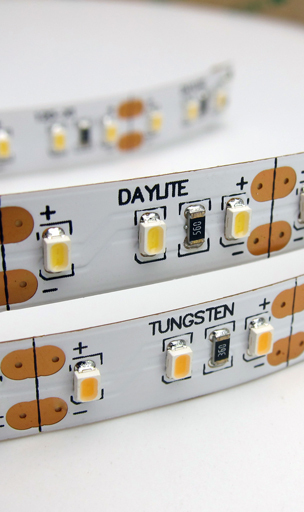 LiteRibbon is a flexible, adhesive backed material with a linear array of low-profile, wide angle LEDs. It is designed to meet the needs of Motion Picture, Television, and HD Video Professionals. LiteRibbon simplifies the otherwise complex world of LEDs allowing the Shooting-Crews and other under-the-gun departments speedy operation. Designed for use anywhere that small, lightweight, battery operated, or frugal power requirements are needed. LiteRibbon can be positioned in small soffits, as control panel backlights, or integrated into costumes or vehicles. Available Light offers a few different LiteRibbon kit options in the following color temperatures: Dedicated 3200k, Dedicated 5500k, 3200K/5500K Hybrid, and RGB (DMX). Please specify required length when adding ribbon to your basket. With advance notice, we can get you any roll of LiteRibbon to specifically meet your needs. LiteGear Battery Power Now Available!